Give yourself a little grace from time to time. Becoming a parent is both magical and daunting. There is no set methodology to parenting. Remember to love yourself a little each day. It helps you survive through the lack of sleep and chaos. Tag team with your partner. It’s okay to ask for help. You’re in the trenches together. If you’re doing it by yourself, find your support system and ask them to walk this journey with you. It takes a community to raise a child. Try and stay away from taking advice from everyone you meet. Find out what works for you and what doesn’t. You will find your own rhythm. Just trust in the process. I had the pleasure to interview Colleen Glaeser, Global Marketing Director for AxxonSoft. Colleen is the definition of a ‘one woman wonder’ — a self-made millionaire lady boss who started her first company at the tender age of twenty-two. Today, Colleen not only owns three companies, but she is the only female to serve on the board of international directors for the Russian Software Company — AxxonSoft. This entrepreneur and ultimate lady boss is known for her dynamic personality, beautiful compassion and strong leadership skills. 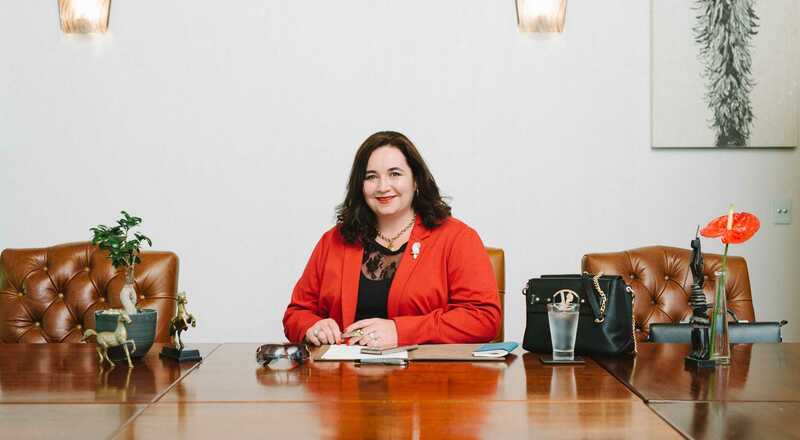 With a positive outlook and willpower like no other, Colleen Glaeser has applied her entrepreneurial skills and sales framework to create her award-winning businesses in the telecoms, security and hospitality industries, all of which she still manages. She holds the role of Managing Director for AxxonSoft Southern Africa, Director for IMC by AxxonSoft. CEO of DCSS South Africa and Managing Director for Karkloof Safari Villas & Spa. She is also the Managing Member for CG Telecoms & Data. Under Colleen’s leadership, each of these companies have experienced exceptional growth, averaging 200% annually. She has proven time and time again that women can be both powerful leaders and imperative assets in any business — both tactically and strategically. With extensive experience in sales leadership and psychology, Colleen is fast becoming a top international motivational speaker, with engagements across the world. She hopes to inspire and encourage women to become the best version of themselves as she believes anyone can realise their wildest dreams with a winning, positive attitude and the confidence to go with it. Can you tell us the “backstory” behind what brought you to this point in your career? Over the past 20 or so years, I have been lucky enough to embark on an incredible journey. One that I hope continues into my future, helping me grow as a woman, entrepreneur, wife and mother. This journey that I speak of pertains to the empire I have built and will continue to grow year-on-year. This empire doesn’t necessarily relate to the companies I own, but to the empire that has become my life. I have always had that entrepreneurial spirit in me. From the moment I started my career in my early twenties, I knew that I was always destined to own my own company and become my own boss. Further to this, I was passionate about the telecommunications industry and there were many opportunities in the sector during that period in my life. As I was in my early twenties, there was a lot more room for me to take risk and forge new pathways. As surveillance and telecommunications work together, the next step for me was to create a surveillance company, with the main goal of meeting the needs of the local market with high performing surveillance technology, as had been seen and implemented around the world. I saw the opportunity for intelligent and tailormade surveillance solutions in Southern Africa, and so, AxxonSoft SADC was born. The funny thing about this journey is that I never asked for it to happen. It has been what some may say is serendipitous and organic. I often speak of how important confidence has been in shaping my life and who I am today. I attribute this empire I have actively participated in to make, to confidence. It is intrinsically intertwined into my identity and I do believe it is responsible for my success. Can you share with us how many children you have? I have one beautiful daughter, Sharon. She is 10 turning 11 and is the light and love of my life. Where were you in your career when your child was born/became part of your family? I had my daughter in my mid-thirties. As I had opened my own company in my early twenties, I had been in the telecommunications industry for over a decade when I had her. It was time and I was ready to start my family when I did. The timing was perfect. Did you always want to be a mother? Can you explain? I have always wanted to be a mother, my daughter forms part of who I am and I so very grateful to be her mom. There is nothing that brings me greater joy than being a mom. Everything I do is for her, creating a legacy that will make her proud. I focused on building my company in my twenties and that was so important to me, once I had gained momentum and settled — if you can call it that — I was able to take the opportunity to start my family, and that’s exactly what happened. Did motherhood happen when you thought it would or did it take longer? If it took longer, what advice would you have for another woman in your shoes? I believe it happened exactly when it was meant to happen. I believe in the serendipity of it all. Sometimes it’s tough — particularly when one knows they are destined to be a mother — as we want things to happen in our own time and life doesn’t always happen according to our plans. I became a mother later in life and it happened at the perfect time. I couldn’t imagine it happening any earlier or later than it did. We just need to believe in our timing. When it’s meant to be, it’s meant to be. Trust in the process. Can you tell us a bit about what your day-to-day schedule looks like? My average day or work week is busy indeed. Between global director meetings with the AxxonSoft team to weekly marketing strategy meetings with my team based in South Africa, I am constantly looking for opportunities to take my companies forward. In between this, I help drive awareness of AxxonSoft’s Deep Learning technology in war against poaching as well as manage the reserve I own in the Kwa-Zulu Natal Midlands. I am lucky to have an extraordinary team under me, who effectively help me role out our campaigns across the globe. Has being a parent changed your career path? Can you explain? Absolutely, I think motherhood fundamentally alters all aspects of your life. My daughter is first and foremost, my highest priority. She comes first. I make a concerted effort to ensure that she knows this. Despite how busy work may be, despite travelling the world for work or starting new business ventures, she will always remain the most important thing to me. When I make business decisions, I always consider how it will affect her. If I have to be away for work purposes, I make sure that I spend extra time with her before and after my trip. I am very lucky as to where I live and that she is able to grow up surrounded by nature and truly experience the beauty of growing up in the most wonderful setting. Has being a mother made you better at your job? How so? It has most certainly has done so. Motherhood has helped shape the woman I am today. It has inspired me to be a better business woman, a better person and a better wife. There is so much I learn from my daughter each day. It’s an enlightening experience. I always think about how she would be impacted when I make decisions at work. What are the biggest challenges you face being a working mom? Trying to find the balance between being a mother and being an entrepreneur and boss. It is a delicate act of discipline and I have to work hard each day to ensure that I find balance, juggling many commitments, homework and extracurricular activities. I make sure I am part of the special moments in my daughter’s life, whether they are big or small. I am very lucky to have a husband who is just as involved as I am. Between the two of us, we are able to make it work. Are there any meaningful activities or traditions you’ve made up or implemented that have enhanced your time with your family? Can you share a story or example? Sharon loves nature. Karkloof Safari Villas & Spa is her second home, and we love going out into the bush on game drives or picnics. We try and do something like this every weekend. It’s incredible what children can learn when in nature. They are so intrigued by their surroundings. It’s one of our favourite past times. We all live in a world with many deadlines and incessant demands for our time and attention. That inevitably makes us feel rushed and we may feel that we can’t spare the time to be “fully present” with our children. Can you share with our readers 3–5 strategies about how we can create more space in our lives in order to give our children more quality attention? As a wife, mother and owner of four successful companies, the thought of staying motivated can often feel overwhelming. There is so much to do and only so many hours in the day to get through everything I need to. I remind myself daily that I would not be where I am today, if I had not constantly motivated myself to move forward, to achieve success, both professionally and personally. ONE STEP AT A TIME. IT’S NOT A RACE. This may be a bit if cliché, but “Rome wasn’t built in a day.” Try and not be too hard on yourself, trying to be the best parent in the world. We are allowed to make mistakes. We always seem to be chasing perfection and instant gratification. This sets us up for failure. Don’t rush to get to the finish line right away, you will burn out and lose motivation. INCORPORATE A DAILY MOTIVATIONAL MANTRA. I refuse to leave the house without reminding myself of what I am capable of, what I can achieve each day, and what I am doing to make my goals a reality. I do this every day and recommend that you start incorporating this into your daily routine too. Sometimes we need to encourage the rhetoric in our minds for a positive outcome. Our minds are powerful tools, and if we constantly feed ourselves negative information or thoughts, they tend to come true. This is a hard pattern to change but add an alarm to your phone when you wake up each day, chant three or four positive and affirming sentences about yourself. You will be amazed at how this will change your life and affect how you approach motherhood. For me, sometimes being an inspirational role model is simply how I instil precious values in my daughter. I always remind myself that my role in business and in life fundamentally shapes the woman my beautiful daughter will become one day, and there is nothing more important to me than this. My hope is that, as she grows and becomes older, forging her own life path, she will become the confident and inspiring woman I know she was born to be. What are your favourite books, podcasts, or resources that inspire you to be a better parent? Can you explain why you like them? I love spending time on social media and how moms navigate through their days, balancing motherhood and work. We are a community, striving for the same things. It’s amazing how we can rally together to show support. Sure, there can be a lot of negativity on social media, but you just have to filter through this and find inspiration where you can. We are all in this together. Can you please give us your favourite “Life Lesson Quote” that you share or plan to share with your daughter? “With confidence, anything is possible.” Confidence is my personal motto, it forms an integral part of my identity. It commands how I conduct business and engage with friends, family, colleagues and employees. Let me say this, it’s the one rule I absolutely live by and advocate to others all the time. Confidence factors into every single minute of my day, whether it be confidence at work, confidence on a stage as I am speaking in front of thousands of people, many of them powerful business men, and confidence in my personal life. It is a trait I try and instill in my daughter every day as I know it will give her the courage to create a beautiful life for herself. If you could sit down with every new parent and offer life hacks, must-have products or simple advice, what would be on your list? Give yourself a little grace from time to time. Becoming a parent is both magical and daunting. There is no set methodology to parenting. Remember to love yourself a little each day. It helps you survive through the lack of sleep and chaos. Tag team with your partner. It’s ok to ask for help. You’re in the trenches together. If you’re doing it by yourself, find your support system and ask them to walk this journey with you. It takes a community to raise a child. Try and stay away from taking advice from everyone you meet. Find out what works for you and what doesn’t. You will find your own rhythm. Just trust in the process. Thank you so much for sharing your inspirational thoughts with us!